1. The Figure above does not appear in Muir-Wood. 2. A different figure, 1.5 from the SOD, was criticized by reviewers. Figure 1.5 was a scatter plot of temperature anomaly and normalized damage 1950-2005, shown below. 3. In response, the IPCC instead chose to make its own Figure SM 1-1 above at the top of this post, which plotted only 1970-2005 and smoothed the data. Without fully controlling for other factors that could affect the trend in losses, we can not draw any firm conclusions about the role of climate change in loss trends. 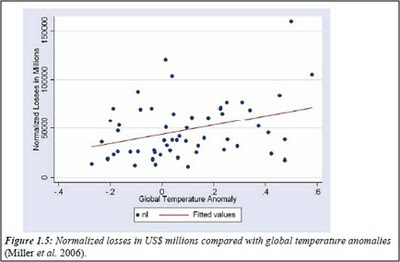 In addition, any conclusions about a relationship between global warming and disaster losses are complicated by the sensitivity of statistical results to a few high-loss data points, the short historical loss record, and the limitations of the normalization methodology. 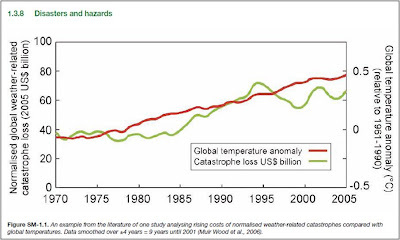 Hypothesis: The IPCC created a graph that did not exist in the peer reviewed literature or in the grey literature to suggest a relationship between increasing temperatures and rising disaster costs. In the comments Ian does some brilliant detective work to locate the origins of the above mysterious and misleading graph from the IPCC AR4 WGII Chapter 1. I spent some time parsing through the FOD, SOD and related comments for this portion of Chapter 1 of the WGII report. “Fig 1,5 is not reliable from a statistical point of view because the significant trend is pulled upward by "outliers" (especially 3 points with losses >100000 ) which provoque a pseudo-significancy as it is suggested by the authors themselves in lines 18-21 [of the SOD] "Removing......entirely". So I propose "Since 1970 the global normalized results do not show any statically significant correlationn with global temperatures." and to remove the end of the paragraph and the figure 1,5 because it can mislead a reader not familiar with correlation." Concerns were also raised by Indur Goklany (US Dept of the Interior), Francis Zwiers (Can. Centre for Climate Modelling and Analysis) and Nathan Gillet (University of East Anglia). “I’m wondering if too much space is devoted to Miller, given the inference one draws from Fig 1.5 is senstive to the inclusion of individual outliers (as pointed out in the text) and that it is acknowledged that early data are incomplete. Some additional comment on data quality, beyond just completeness, is probably in order (I'm not expert, but this type of data would presumably be influenced by all kinds of factors, including varying political influences and changes in reporting practices, that might confound any climate signal)." I’ll leave it to the stats types to argue over whether the answer was actually responsive.